I got the book ‘A Perfect World in Ribbon Embroidery and Stumpwork’ for Christmas, and it’s wonderful! Di van Niekerk is from Cape Town, South Africa, and her designs are gorgeous. 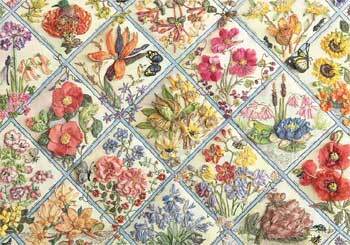 She has a real flair for realistically representing flowers and animals from her native country, using interesting materials. The book shows in great detail how to make this panel, one ‘diamond’ at a time. The panel uses many shades of hand-dyed silk ribbon, which can be bought from Di by mail order (see the stockists page on Di’s website for details of a stockist in your country), or you could of course use any brand of ribbon instead. The panel also requires Chameleon or Rajmahal silk thread, but any stranded cotton or silk thread could successfully be substituted. The design can be transferred onto fabric by enlarging a line drawing from the back of the book and tracing it on, or a printed colour version on cotton fabric can be bought (this is what I’d prefer to do). The design is then stitched over, using stumpwork and ribbon embroidery stitches, to make the most amazing ‘sampler’ style picture. It’s a very beautiful and original design. Instructions are given for each panel in separate chapters, so you could make just one ‘diamond’ if you want to (the fabric design ‘diamonds’ can be bought individually, for this option, if you prefer). The photos in the book are very clear and detailed, and everything is explained really well. Good finishing instructions are also given (many books often fall down on this). If you’re tempted to have a go at this lovely sampler, and want to create something really great, then the book can be bought through my newly-opened online bookstore, where I sell only the kind of embroidery, doll’s house and spiritual books that I would like to (or already do!) own. The February issue (number 141) of The Doll’s House Magazine, published by Guild of Master Craftman Publications, has just gone on sale. 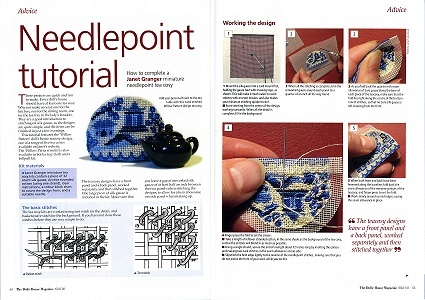 This month’s issue has a three page article, featuring a tutorial on one of my twelfth scale teacosy designs – the ‘Willow Pattern’ one. If you get to see a copy, there’s a special offer code in the magazine for people who buy the teacosy kit, giving a 20% discount off the usual price. 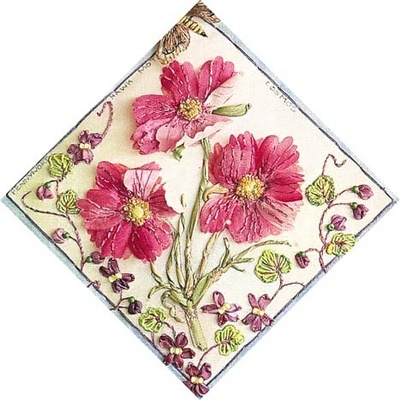 I have five teacosy designs altogether, and the kits for them are available on this page of my website.